How’s this for a rags-to-riches story? 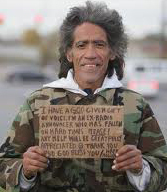 When 2011 started, Ted Williams was a homeless man in Columbus, Ohio. He possessed an incredibly rich, refined announcer’s voice, but lost everything else and became a convicted felon due to drugs and alcohol. Then a guy made a quickie video of him on the street, begging for handouts. Ted spoke on film, mimicking a radio announcer (his former career), and the guy put the video on YouTube. Well, faster than a government runs up debt, the video went viral. It was viewed by 13 million people and, overnight, Ted Williams and his amazing voice became a star. Talk shows battled to get him on TV first, thousands of newspapers published articles on him, and job offers poured in from companies such as Kraft, MTV, and the Cleveland Cavaliers NBA team. Through it all, Williams, 53, did three things: vowed to get his life together, be a real dad to his nine children, and give credit where credit belongs. So, if you believe in God, did He ignore Ted Williams for years? Was it just a random YouTube video that turned Ted’s fortunes around? Valid answers to each question can be based on what you want to believe. The bottom line is: do you want to think of God as a big nothing or a distant ogre? Or do you want your life enriched – just as Ted Williams’ life was enriched – by thinking of God as the loving creator of the universe who cares so much for us that he sent his son Jesus to live, die, and come back to life for us?